Read and Black and Learning All Over: My First Linky Party!!! Yay! This is my first time participating in a linky party, and I'm excited! 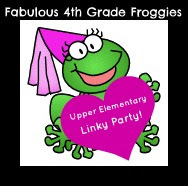 Fabulous 4th Grade Froggies has invited all 3rd, 4th, and 5th grade teachers to link up. What a great idea. I too am always looking for new blogs to "stalk". I don't think I can ever have enough blog links on my blog reel. Do you? So, if you're here on my blog because I linked up, awesome! Now I look forward to checking out all of the other teachers who've linked up as well!! Thanks for joining my linky party! I LOVE your blog name....AWESOME! Can I assume you are new to blogging? I am not sure if you are aware of Teaching Blog Traffic School but it's amazing! You should check it out. So many people to learn from and to network with. Anywho, I look forward to reading more of your posts and hopefully we will have a huge list of upper elementary blogs! I found you through the linky party. I love the colors of your blog!! I found you through the linky party also. LOVE the title of your blog and the ladybugs. I am a new follower. Thanks! I'm so thankful for this wonderful linky party idea. I've found so many new wonderful blogs myself! I, too, found your blog via the linky party! I'm following you now. :) Love your ideas and books on figurative language. I need to hit these skills when we get back so my kids don't bomb that part of the standardized tests! Eek!! Thanks for checking me out. I love your blog as well! Welcome to blogging! I found you through the linky, too! Thanks for checking me out. I'm now following your blog too! I'm excited too! Thanks for following .. and now I'm off to check out your blog! Hey, I found you through the link party too! ...and I am your newest follower! I love your blog title!!! Hi. I just found your blog. How Cute!! I love your title :) I am a new blogger as well and I'm enjoying this blog party! I am your newest follower! Come and visit my blog when you have a chance! I went and checked out your blog too! Thanks for following. Thanks and congrats on your new blog as well! What a cute blog! I found you through the linky party and I'm now following your blog. I would love for you to visit mine when you get a chance! Just stopping by to let you know there is a permanent linky party at 3-6 Free Resources! Its a brand new site just for us 3-6 teachers. Hello! I found your blog through Fabulous 4th Grade Linky Party. I'm a first year teacher and will be teaching third grade in September. I'm both excited and nervous about having my own classroom. My new hobbies are searching for teaching blogs and Pinterest. LOL! I'm impressed with all of the blogs and ideas from novice, to veteran teachers. I finally got around to creating my own blog! I originally planned to create a blog during my student teaching but it never happened. So I decided to chronicle my first year in third grade. I'm new to the blogging world so bare with me. I hope you will visit my blog and join!